The ObserverTree is a platform situated 60m above the ground in an old-growth Eucalyptus tree, in the heart of Tasmania’s southern forests. On the 14th of December 2011 conservationist Miranda Gibson climbed a rope to the top of the tree and vowed to stay untill the forest is protected. Miranda’s upper canopy home is a tree under imminent threat, in a forest due to be logged any day now. The tree top platform is fully equipped with the technology to communicate to the world. This website features Miranda’s daily blog about life in a tree sit, commentary on the state of the forest negotiations, updates on flora and fauna monitoring and video footage from the tree sit. Watch this space for celebrity and guest blog appearances too! If logging commences Miranda will also, sadly, document the destruction of the forest around her, streaming these images out to the world. The traumatic process of forest destruction that occurs every day in Tasmania is generally hidden from public view. Now these archaic practises will be fully exposed, allowing the global community to see for themselves what is really going on in our forests. This area of forest is in an area earmarked as one of Tasmania’s future forest reserves. It was promised protection by the State and Federal governments. Yet, if the logging industry has its way, it is going to be logged this summer! What is really going on in Tasmania’s forests? 2011 could have been a year of celebration for Tasmania’s wild forest. In October 2010, A statement of principles signed by Environmental NGO’s, industry groups and Unions paved the way for comprehensive forest protection and a restructuring of the logging industry. But, more than a year later, not one tree has been saved, more cash has been delivered to the timber industry and destructive logging continues in some of our island’s most sensitive and iconic forest areas. So what went wrong? A series of broken promises, industry pressure and Government backpeddling have jeapordised the progress of this historic agreement. First, in December 2010, the Tasmanian Government failed to implement a promised moratorium on the logging of 572,000 hectares of high conservation value forest. Forestry Tasmania, the State-owned forest management agency, flaunted this failure of leadership by pushing ahead with roading and logging in some of Tasmania’s most contentious forest areas. In August 2011, the Tasmanian and Federal Governments signed an Intergovernmental Agreement (IGA) that promised immediate protection for 430,000 hectares of high conservation forest. The IGA stipulated that the Tasmanian Government would ‘ensure that the 430,000 hectares of State Forest identified … is not accessed [for logging]’ and that the Commonwealth would compensate any contract holder affected by the protection of these areas. But the agreement also required that hundreds of thousands of cubic metres of sawlogs and veneer peeler logs must continue to be supplied to the industry. Malaysian logging company Ta Ann Holdings has been promised an ongoing supply of over 265,000 cubic metres of timber per year from Tasmania’s forests. Forestry Tasmania argued that they could not supply this timber without continuing to log within the 430,00 hectares. In another backflip, the Tasmanian and Commonwealth Governments have turned a blind eye to the ongoing logging of pristine forests within an area they earmarked for immediate protection. As 2011 draws to a close, Tasmanians are suffering the loss of hundreds of hectares of native forest that should have been saved from logging. Activists have occupied forests on the flanks of Mt Mueller to document this destruction. Prime Minister Julia Gillard must keep her word before the trail of broken promises undermines this crucial opportunity to protect Tasmania’s forests. Ta Ann Tasmania’s wood requirements are driving the continued destruction of vital high conservation value forests. The supply of peeler billets to Ta Ann Tasmania is the major factor stopping forest protection, according to the official reports on the failure to reschedule logging operations. Forestry Tasmania is targeting areas rich in this wood supply, which equates to preferentially targeting high conservation value forests. Furthermore Ta Ann Tasmania received wood from areas containing old growth forest, as defined by the Tasmanian Regional Forest Agreement (RFA), on at least 35 occasions throughout 2009-2011. The wood used by Ta Ann cannot be described as eco-friendly in any way. Ta Ann has failed to ensure that their contract be supplied from outside the crucial forest areas, including such iconic areas as the Weld, Styx and Upper Florentine Valleys. Instead the source of their wood has been extensively misrepresented. Ta Ann’s wood supply has laughably been described as a plantation-based supply. In Tasmania, where Ta Ann is at least forced to admit that their wood supply comes from native forests, they continue a misinformation campaign focused on the fact that they process wood of small dimensions. This material has often originated from high conservation value forests, which were destroyed to fulfill Ta Ann’s requirements, but they imply that the forests were all regrowth and of no conservation value when this is not the case. Ta Ann has misled its customers in Japan and Europe by falsely promoting some of its Tasmanian products as ‘environmentally friendly’ plywood. Ta Ann, their partner SMKC, and their Japanese customers claim that these ‘eco-products’ are sourced from plantations and forests that have been replanted after logging. However, the reality is that Ta Ann is processing and selling timber products that are sourced from the logging of old growth forests, high conservation value forests, and forest with recognised World Heritage values in Tasmania. Mount Mueller is a spectacular mountain located near the Styx Valley, Southwest Tasmania. The Weld, Styx and Florentine rivers all flow from this iconic mountain. While the mountain top is protected in the Tasmanian Wilderness World Heritage Area, the pristine ancient forests at its base remain under threat from industrial scale logging. The Tree Top Watch Spot lies in the heart of these forests. This area of forest is known to Forestry Tasmania as “TN044B.” We have affectionately named it “Julia’s Forest.” Named after Prime Minister Julia Gillard. She is, after all, responsible for the life of this forest. On the day she signed the Intergovernmental Agreement, making a promise to protect this forests, she became it’s guardian. Julia will be accountable for every tree that falls in this forest. Julia’s Forest is a prime example of Tasmania’s spectacular and unique forests. The ridges are lined with giant Eucalpyts, the tallest flowering plant on earth. Steep fern gullies are bursting with tree ferns, sasafrass, leatherwood and other Tasmanian rainforest tree species. Unique and threatened wildlife have been found in Julia’s Forest, including Tasmanian Devils, Spotted Tailed Quolls and the unique Tasmanian White Goshawks. The waterways in this forest are also home to a rare and threatened Hyrdrobiid snail. The terrain is so steep in this forest that the loggers need to use specialised cable logging machinery. This is despite the historical land-slips that have occurred in the area. This type of logging causes irreparable damage to the soil and waterways. 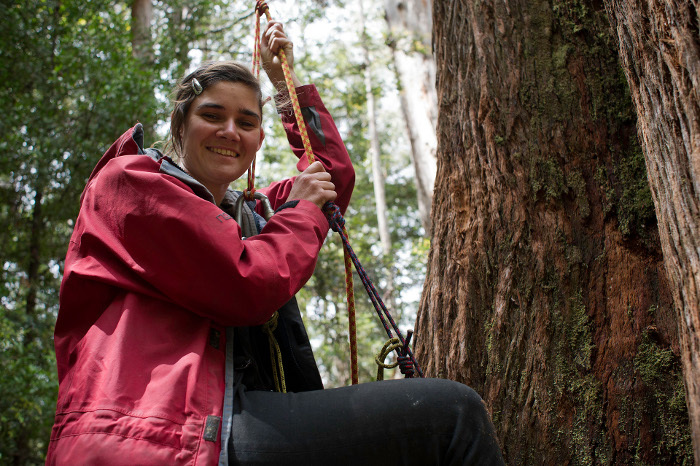 Miranda Gibson is one of Tasmania’s most committed front-line forest campaigners. She has been a core member of the grassroots environment group Still Wild Still Threatened for over five years, living high in the trees at Camp Floz, a blockade in the Upper Florentine Valley. Miranda has been the media spokesperson for Still Wild Still Threatened for the past year and half. Miranda is a qualified high school teacher, specialising in Study of Society and Environment and English. She has put her career on hold to dedicate herself to the campaign to protect Tasmania’s forests. Miranda was one of 13 forest campaigners who were targeted by woodchipping giant Gunns Ltd when the company attempted to sue these activists for the protesting at a woodchipping facility. The case was eventually dropped after about two years. In 2008 Miranda was one of two activists assaulted by logging contractors in a vicious attack that was caught on film and made international headlines. Undeterred, Miranda has worked with other Still Wild Still Threatened campaigners to monitor wildlife in Tasmania’s threatened forests using remote-sensor cameras. Their work has documented the presence of threatened species including Tasmanian Devils and Spotted Tailed quolls inside areas scheduled for logging. In 2008, Miranda also co-authored a guide to the “Flora and Fauna of the Upper Florentine Valley”, the sales of which have helped raised money for the forest campaign. Miranda is passionate about giving young people the opportunity to learn about and learn from the wonders of the natural world. She is an inspiring example of an individual willing to take a stand to ensure that future generations can experience and enjoy our precious natural heritage. The Observer Tree is a project by Still Wild Still Threatened, a grassroots environment group based in Tasmania. SWST advocates for the immediate formal protection of Tasmania’s precious Southern Forests using a combination of political and corporate lobbying, community education, research, exploration and frontline direct action. We also promote the creation of an equitable and environmentally sustainable forest industry in Tasmania. Apart from supporting The Observer Tree we also run Tasmania’s longest running forest blockade Camp Florentine. And are involved in peaceful community action to highlight the values of Tasmania’s forests and advocate for their protection. Hi Miranda, this is a really interesting story and I will be following you daily. I hope you get to enjoy your time amongst the treetops despite the chainsaws. Brushing your hair is not the only thing that makes you a truly inspirational eco warrior. Thank you for what’s you’re doing for Tasmania’s beauty and health. Ingredients; cheap tube of silicon, roughly inch square battens of wood or poly pipe, long enough to lay along all gutters. Method; silicon battens to the sit’s floor, INSIDE the gutter and tarps. Any leaks should then be directed to the edges. Nice and flexible, will move with the sit! Say hi to the Currawongs! Well done! I hope you manage to stop the logging of this coupe. I was in the Florentine Valley 4 years ago and couldn’t believe that felling of 80m trees still goes on. These ancient and magnificent tall trees are the heritage of all humankind. How dare they be logged for private profit! The logging of old growth native forest in Tasmania is a source of shame for successive State and Federal governments in Australia. when will they finally see the light? Thank you so much for acting on behalf of the many people who are deeply concerned and aghast at the continued destruction of Tassie’s forests. I hope that you have a peaceful Christmas and that 2012 brings a final victory for our forests. Thanks again for your passion and dedication. I passed Mount Wedge yesterday the 22nd December. Much more devastation has happened on its lower part in the last 6 months. It can be seen from far away. I truly despair of Tasmania’s politicians and especially Forestry Tasmania. I worked on the Franklin Campaign. We won after much effort. How can we just watch this awful destruction of Wedge continue? Happy christmas or other non specific celebratory wishes to you miranda .wish i could be doing exactly what u r .Thank you so much. Hi there Miranda, Wow you’re amazing for what you are doing, and at christmas! I saw the santa video, it was pretty funny and i’m glad you got some pudding! 😀 Well i wish you all the luck in the world up there, hope the weather is good for you and i especially hope you don’t see any falling trees from where you are. Will send Julia an email to let her know what i think, and thank you so much for your dedication to such a worthy cause. Merry X-mas to you Miranda. That your wish will come true soon – even if Santa Claus have not delivered it. HI Miranda and the SWST crew and HUON crew. Thank you so much for your determined focus on protecting our beautiful old growth forests. It is so baffling that they are still being logged for profit. You guys really are an inspiration, your work has opened my eyes to issues that i would never have been normally exposed to! Thank you! Thankyou Miranda for bringing Australias attention to this horrible destruction. You rock! Every bit counts and often direct action counts the most. Wish I could come and join you. I heard the interview with you on MegaherZzZ this morning which brought me here. Bravo to you and your supporters for acting against this depredation. I wish you all the best. Thank you Miranda, from Santa Cruz California where I wage the daily fight to save our big old trees. How inspiring you are! Keep heart through the tough times. I put up a couple of posters in my area. I don’t think that your cause is getting the right publicity or enough of it. I was just led around the garden path by the ABC trying to find out more about the story. Why don’t you try other medias’, even the rubbish media, anything that might help. Cheers and best of luck, your braver than me! I have also not heard anything in the media on the mainland about this. Your activities may be publicised in Tas but are not getting the coverage they should. Fantastic effort on behalf of all true conservationists. We are all very thankful. It is so depressing in Victoria, at least there seems to be a little bit of hope in Tassie, but it seems rather fragile. There is no hope in Vict, only from legal challenges. Miranda, you are a legend. I reckon you are on a winner, with recent events such as the difficulty of selling wood chip, the Ta Ann Holdings loss of contract and the national protest. Your action is a brilliant peaceful protest. PS I stayed at your Mum and dad’s with my wife on Sunday eve. It was great. Hi Miranda – Keep up the good work. The editors at Earth Tribe, an environmental activist site, have just put up a news story about you, and a banner. I know you’re busy protecting your forest. But if you have a little time, could you look into this online petition to save a majestic silk-cotton tree in the island of Tobago? The government claims it’s undermining the road next to it, and instead of looking for options regarding the road itself, there’s been talk of destroying this jewel of nature, which is older than all of us. We need all the help we can get because Tobago is a small island and they’re asking for 56.000 signatures (that’s more than the entire population!!). Please, if you have a minute, go to https://www.change.org/petitions/tobago-house-of-assembly-reconsider-any-plans-to-destroy-the-runnemede-silk-cotton-tree. And, if you have 5, please share the link with anyone you think might want to help! THANK YOU! Thank you so much for doing what you know is so important. 85 days in a magnificent tree is pretty amazing. Your efforts are appreciated more than the internet would have you realize !! Keep up the good work and the tree ! When logging these areas ceases, we will all be rewarded. Gostei vou por em favoritos, muito bom seus conteúdos. warm support from santa cruz, california, usa. where i also fight the good fight to save old trees. just lost a battle today to save five old blue gums from PG&E ( Pacific Gas & Electric). Co.
your brave stand is ongoing inspiration. thank you so much. get the message out as far as possible. You are an inspiration. Well done so far, and well done for the future! Even though I don’t know you, I am proud of you for taking a stand for the forests. Hi Miranda, Thankyou for all that you are doing for the beautiful forest in my favourite state, the forest is unable to defend it self and needs people like you (and all the environmentally aware people, here’s hoping more come on board), so again thankyou for all your work. Barbara in Sydney (where my work is) . I can’t believe that there are still old growth forests in Australia being logged. This is very sad. We have no right to destroy the planet just because we can. It is unethical. I’m sick to death of the corrupt incompetent government of this state. Politicians up to their snouts in the Gunns money trough. The morons on both sides of politics in Tasmania are equally stupid, stuck on the idea that you have to dig it up, chop it down or shoot it to make a buck. I refuse to vote on principle and long for the day when enough people stand up like Miranda and say “we’re watching”. I am and I’ve been blasting away at any company even remotely likely to support the likes of Gunns. Idot politicians take note: YOU HAVE NO SOCIAL LICENSE and nobody believes a bloody thing you say. first visit. Love your site, and your sight. Love your vision. Thank you – let us try to find a way to gove back to Her, more than we take. We just talked to Warren and Margot about their visit to you today and we are totally in awe of what you are doing. Its a huge achievement! You are up there, bearing witness for all of us who deplore what is being done to our amazing natural heritage and we totally support what you are doing. All power to you and your team! Michelle from Penguin here. I only discovered your blog a couple of days ago. I think about you all the time now and want to thank you an behalf of all Tasmanians and Australians for having such amazing courage and passion to protect our wonderful forests. I will send positive thoughts out for you every day. What you have already acheived on a human level gives me inspiration. I loved the video “Conversations with Amanda” that you did with Lily. I think it is a fantastic idea; interesting and very entertaining with a wonderful backdrop. If there is any thing I could do that you feel would be useful please reply. i keep thinkin of that giant tree in avatar…& hopin u got wilderness wear merino base layer thermals on…& their thick socks….& my mind starting to race thinkin of all the heatin options available…those heat packs u press to activate & stay warm for hours…then u boil them to recharge & use over & over….a bloody huge bag of them ready to activate……i’m an old swaggy from way back so know u’ll be fine in your swag with a right sleepin bag…dunno if a canvas tarp shelter is possible to get up there….u might be alone up there love, but not in spirit…bet even the forest loves ya….must be so many people thinkin about u all the time…i am so pissed with the main stream media…i’ve seen nothing of u at all…in fact if it wasnt for bob browns facebook page i still wouldnt know….anyway your a bloody legend in my mind…a true EARTH person fed on pure sweet air…i remember my time in the old growth forest down in east gippsland. Errinundra…the glow in the dark mushies & the sugar gliders…that water in the stream & the AIR….OMG that AIR…when i got back i felt 10 years younger…i’m sure it was the air…real air for the first time in my life…so i reckon when u get through this u’ll be as fit as a scrub bull:)…sure blessed to be in that wonderful place…honourable cause too…..GB Miranda. Thankyou on behalf of everyone that can’t be up there themselves but are hoping to very soon. Miranda it’s fantastic what you are doing, good on you. So many of us are right behind you. Hi Miranda, I found out about you when Bob Brown mentioned you in an interview. Now that he is retired, he has time to go and visit you, he said. So I checked out your blog and I am nothing short of impressed and inspired. I will spread the word about you and my 8 yo son is planning a presentation at school about you and the Tamanien forest. I send you a warm hug from Brisbane. Thanks for your commitment to the forests, I envy your experiences, the views alone would make anytime aloft a lifes fulfillment. Please keep your passion, and the PM to her words. (with our help of course). Keep up the great work – and we are really looking forward to the video showing your Mum’s visit to stay with you up the Observer Tree. Great Mum! Hello Miranda, I am born Australian, living in Holland now. I have seen many beautiful places in the world and sad enough it is the same story everywhere.The greed of companies but also the oblivious minds of needy consumers destroying our planet. At my age I can call myself lucky to have seen some of the beauty of nature but I still want to see more, but more important I want my children and others and future generations also see enjoy the beauty of our planet. Even more this unsustainable way we humans deplete our planet has to stop. No matter if it is forests, oceans or other resources. I hope your treetop action, like the butterfly in the chaos theory, can one day help to cause a storm or awareness. I am very much inspired by your work for the trees. good on ya from n.q. australians im sad to say are an ignorant bunch, who cant see past there morgage and house full of crap. its the same here in mission bch. no thought for there children or grand children. to busy to think. your gold you are……..GOLD! we love the earth to…………the hawkins mob. wow, you are an inspiration Miranda, thank you for your amazing sit in to save the forests. Hi Miranda, It was great to hear you speak through Bob Brown’s phone call from the Byron Writers’ Festival today. You are a really dedicated and inspirational person and it’s because of people like you that we humans haven’t completely destroyed the planet yet. Keep on fighting for our forests! I hope today will bring an agreed resolution for the IGA to proceed.That the ENGOs and the industry negotiatiors can protect these forests. And that after the weekend’s weather, you are able to come down, to touch ground. This is amazing what your doing I’m very glad that I’m not the only one that cares about the forests. I hope Julia Gillard realizes how bad this is. Just wanted to say ,Thankyou. You are trully an amazing lady for standing up for your beliefs.And saying NO to LOGGING these magnificent trees in the beautiful Tasmanian Forests. I have had the pleasure of seeing this wilderness and i have to say its breathtakingly beautiful and should be protected for all of us to experience. And not used for PROFIT. I saw your interview on the Sunrise program this morning, I live in Melbourne, Victoria and was so moved by your story, I love visiting Tassie for its natural beauty, but most of all its forests. So if i had a wish, it would be that the goverment kept its promise to protect these Trees & Forests and to Australians. Before they are all gone and that would be a tragedy.I salute your efforts and you are in my prayers, take care of yourself and keep warm. I am Liam, a student from 3\4G, Thank you for your time today.My class and I are amazed how you have stayed up in a tree for 250 DAYS! I don’t think I can stay up in a tree for that long.We hope you can SKYPE again. Watching you on italian tv now. Great project. Thank you for fighting. I saw you in tv. I saw you from milan, italy tonight. I’m with you. you are very great ! I’m from Italy and see you at TV programm at LA7 (Missione Natura) it’s a wonderful idea this project. In italian language. Spero che avrai successo e non sarà invano il tentativo di scacciare queste compagnie che vogliono radere al suolo la foresta della Tasmania. I am Ellie, a student from Sacred Heart School. I am doing a project on trees with one of my friends (Bronte). Mabey you’ve heard of Zoe. Well I am from her class. What you are doing is helping not just nature but the trees. Helping the trees is being sustianable and that’s kind of you to give up your own time to camp in a 400 year old tree so the loggers get taught a lesson to replace that spot with another tree. Miranda I understand why your doing it but why are you sleeping in the tree that is 60 miters high in the sky from land? When you get this email please send one back. I love how you are helping naure and my class 3/4VN is doing a topic on suitability and my group is doing it on the possum and how logging is effecting them all. I’ve just finished reading “Into the woods” By Anna Krein. It certainly opened my eyes to the disturbing and saddening things going on in my home state. I think what you are doing is amazingly brave, you seem such a strong woman from what I have learnt about you. It’s going to be an interesting time in the weeks ahead with the decision regarding Tassie’s forests about to be made. What are your thoughts on this? After campaigning for 30 years on behalf of Tasmania’s forests, the last three weeks have been critical to reaching an agreement between environmentalists and the timber industry. Negotiations have resembled crisis talks, literally lasting through the night in an effort to find a workable solution for both the environment movement and the forestry industry. We have advocated for the protection of Tasmania’s old growth, wilderness and high conservation value native forests, while still being able to secure wood supply to the Tasmanian timber industry and its three main sectors – the large saw millers, the smaller country saw millers and the veneer sector. Before agreeing on this, an elaborate computer modelling process was needed to ensure that the projected wood supply was available. Unfortunately, the process uncovered new information revealing that there was significantly less wood available than had been previously identified. This meant that we either had to agree to a smaller reserve system or significantly reduce wood supply. The crisis led to senior ministers from both the Commonwealth and Tasmanian Governments joining in the negotiations. On the 15th August, we had a major breakthrough with agreement by all parties to the immediate launch of a wood supply buy back program by the two governments and a range of other measures. In four to five weeks time, following the conclusion of the buy back program and a range of other measures, the negotiations will re-convene for a final time to establish the new size of the industry and the final size of the reserve system. In the meantime, the signatories have released an interim agreement, missing the two key components outlined above – reserves and wood supply. After decades of hard work for the preservation of Tassie’s forest, we thank you for you support and look forward to sharing with you the final details of the agreement over the next few weeks. Heard nothing about this in print media and just stumbled across it on Twitter. I think we need to pressure the PM via Twitter, Facebook and any way we can. I just messaged her on twitter, am about to do the same on FB, how about everone else gets started too. Just plant non-THC industrial hemp and not only will there be enough lumber, wood pulp, etc. the seeds are the best biofuel on the planet and the hemp plant absorbs more CO2 than another plant. Oh, and that’s why it’s illegal to grow it!! Wake up! I’m an American living in Turkey and read about your crusade on CNN! I commend you for your perseverance, creativity and vision for a better world! You are an inspiration to others – each person’s purpose/vision is valuable and interconnected. Blessings and prayers for others to follow and do what is right!! I have no comment about the underlying issue – what I would prefer to draw attention to is your dedication to your cause. You have shown steadfast support for your specific cause, and if more people were willing to stand up for their values – or to actually HAVE values worth standing up for, I think the apathetic fog that’s been covering our culture for so long would start to drift away. Maybe people would care about something, for once. You are an inspiration – keep it up! Never loose your faith and your gut, and I’m sure the tree you’re standing on will give you back the strenght you spend for her. Wonderwoman! I am so proud of you! More soon! I’ve been distressed about the loss of a cluster of mangroves, which hurt my soul to witness. I am part of your cheering section!!! I suspect that a few of my friends will give you a little moral support! We’re cheering you on here in Ecuador..our thoughts and prayers are with you..
Hi Miranda, How amazing! Thank you so much for making a better world for all of us! When you have finished your time in Tasmania would you consider doing a tree sit in forests where orang utans are losing their habitat or perhaps the Amazon? Those forests are being destroyed at a shocking rate and I feel that orang utans will soon only be seen in zoos. You are very brave and committed. I wish you much luck and success. Be safe. Hola miranda eres increíblemente valiente, desde colombia sur america un caluroso saludo. Thank you soo much Miranda and all the crew who have made this possible. You are a credit to the human race and looking after all of our futures let alone our collective souls. Thank you from the bottom of my heart. Stay strong and know you have a lot of supporters out here, though most not in nearly as beautiful surrounds. Great work Miranda, keep up the fight! We need more people like you. Very inspirational. Just need to say a massive THANK YOU for your amazing and inspirational efforts… I hope the extra awareness that you and Still Wild Still Threatened are creating helps to save the forests at the base of Mt Mueller. Hope your staying warm n dry on a day like this! If you have any recommendations or advice on partitions ect that I could sign to help your cause, then pleaded let me. Ta.. Luke. Hello Miranda, you were on the front page of the BBC News website midweek. There’s a link to in my latest blog post here: http://thenaturephile.com/2012/12/15/looking-after-the-fishes-and-the-forests/. It’s a selfless and wonderful thing you are doing and the rest of the world is finding out about the plight of your forests and taking notice. The world needs a lot more people like yourself to make a stand. Happy Christmas. I’m a kiwi but now live in Ireland… I’m doing research on the art & politics of forests so I have enormous respect for what you are doing. In my case here I’m transforming a small monoculture conifer plantation to a permanent forest… you might be interested in reading an article about it here.http://issuu.com/cathyart/docs/deepsustainability_forests2012.. the old growth forests of NZ have long inspired my work and its great to know there are growing numbers of foresters wanting to move to permanent, non-clearfell forests now but there needs much more knowledge of this. Its so shocking that clearing of old growth forests in any part of the world is still happening – thanks for trying to still remind us about it. You are doing such great work for us all, thank you. You have put a solid face on the front of protecting the beautiful forests of Tasmania and the world. Well done. I spend a good proportion of my working life up a tree in a harness, so I can imagine what it must be like to do that 24/7/365. Your perseverance and dedication is incredible. The biodiversity of our forests and all the forests in the world, the richness of life and the uniqueness of each one is so so so important. To preserve, protect and respect the wilds and to leave them there is so important. …. 1. The widening gap of cultural disassociation between ‘trees are being cut down’ & ‘the products we use that are made out of them’ (paper, books, houses, furniture, protest placards and signs, tool handles, sculpture, toilet paper, etc). I am not an angel here either, I live in a wooden house, my library is huge, and I have wooden stuff everywhere by preference. I am not saying that we should or should not cut trees…. but that we should be a lot more aware of where those trees that are cut down go to. and that if we stop managing and harvesting enough forest trees in Tasmania then we risk becoming an IMPORTER of other peoples forests – possibly those endangered ones in other countries that we care about as well…..
2. Plantations. I am getting the distinct impression at the moment, that the Tasmanian timber-forest industry is being slowly forced into a plantation style of managed forests; which are basically long term monoculture cropping of trees. How can you, as an environmentalist, even allow this thought to be aired without objecting to it as strongly as you do to the old growth being cut down? Plantations are monocultures, lack biodiversity, need chemical additives to help them survive, very few animals can live there, they are bad for the soil, and just generally are a poor substitute to managed native forests. In addition, the timber product is generally considered to be of a lower quality. 3. The black and white view that there is ‘old growth’ and there is ‘plantation’ but there is no option in-between for Managed native forest. Forestry Tasmania has been managing native forests for harvest for decades. There are many patches of Managed native forest that have been logged 2-3 times over the last 150 years and yet look and feel like a biodiverse forest – enough so that Environmental groups want to lock them up and high value forest. The Managed forests have a rich biodiversity because they are planted back with the species that were already there, they are full of wildlife and still contain the high value trees and shrubs that are found in true old growth. When they are logged they are only done so in small patches and only if there is mature forest next to it for the wildlife to escape into. Yes, I am sure it could be done better and this method could be implimented and improved over more of the industry, but this method of management takes more financial resources to care for and, because of the maintenance of biodiversity, has a lower volume output of timber per hectare than plantation. There is also quite a bit of ‘waste’ timber that is useless for construction, furniture, power poles or veneer which is sold for chipping. If the waste timber can not be sold, it is not currently financially viable to harvest the good timber either…..
4. The devision between foresters and environmentalist. On one side are the foresters and logging contractors some of whom have been in the industry for over 60 years, some of whom have only been in a while, many of whom have a rich knowledge of forests, not just how to cut them, but how they grow and how they can be encouraged to regrow as they were before harvest. Some also have an understanding of better harvest techniques; techniques that reduce the impact that logging has on the forest through use of lighter machinery, soil conservation and erosion control. On the other side are the majority of the environmentalist. These seem to be putting a lot of energy, time and commitment into resisting and working against the foresters. In the process they are destroying an industry, its reputation, and thus our supply of LOCAL timber products. What if the 2 sides could work together? What if some of the older, wiser, logging contractors and forestry workers could get together with some of the environmentalists and they all teach and learn from each other? What if people like you and I, (who are really just looking in from the outside and pointing fingers at people who are doing the work), actually spent some time with them instead of standing back and accusing without personal knowledge? What if a better way of managing native forests could be developed this way? A way that is developed by the people who know how to practically do the stuff necessary to manage a forest, along with the ones with the passion to see it done better? Wouldn’t that be amazing? 5. Trees, plants and animals are our ONLY renewable resource. Not stone, or concrete, or metals or oil or other minerals out of the earth or sand for glass, etc. Plastic can be produced from plant oils in small amounts, fabric from plant and animal fibbers, paper, timber, etc; these are our renewable resources. If we care for them well and manage the land well so that we do not create any more deserts and salt flats, if we become true caretakers and gardeners of the land and the forests, we can live on this earth indefinitely. Obviously we need to manage our population and consumerism levels too! 6. There is currently less media and cultural emphasis on planting trees than there is on trying to stop them being cut down; meanwhile, the forest/timber/production industry plants more trees per annum than all the environmental groups put together. Every time I drive down the midlands highway I see all that empty space on the side of the road that could be full of vegetation. All that empty grassy space in towns that could have trees and shrubs rather than a monoculture of grass. All those fields that could have a row or 2 of trees around them, all those bleak dry hills that could do with a bit of purmaculture TLC. There is so much social and cultural emphasis on ‘stopping logging’ at the moment that we have forgotten about planting trees. The revegetation of degraded land is quietly struggling along, hidden from the common view by the anti-logging binge we are currently in. There is a taoist idea that I have always rather loved. The idea is: that you won’t get anywhere very fast by resisting against what you don’t want; however, if you turn about, have a vision or where you do want to go and strive for that instead, then you will get there a lot more quickly. I studied Environmental Ethics with Pete Hay at Tas Uni a few years ago. One of the essay assignments he set was to envision our idea of Utopia and to write about what it would look like. At the time I could not figure out how to get where I wanted to go from the now, so I posited a fictional situation involving colonising another planet. At the time I think the question was too big for me to really understand. Now,I think I am starting to get more of an idea of where I think we need to go from here. But the thing to do is to cut it down and look at smaller chunks of idealism. But what do we want the Forestry industry to look like in Tasmania? really? What should it look like, not just where it is happening in the forest but also at every level of our culture, where forestry practices impact on us and where we impact on forestry? I would love it if you thought about that and wrote about that, I would love it if others would think about that. 1. limit the amount of plantation to the minimum. 2. Protect the true old growth and enough biodiverse forests to act as seed banks, examples, havens and parks. 3. Have long term – and I mean looooong term…. 500 + years – management plans for harvestable forests; and make sure that includes enough timber output to make Tasmania more than self sufficient for timber products. 4. Plant trees and shrubs and plants everywhere (minimise the grass monocultures). 5. Examine our management practice and develop better ways to care for the land, the soil and the biodiversity of flora and fauna. Do this by incorporating the knowledge of the old loggers, the modern environmentalists, siviculture, and also Purmaculture. 6. Reinstate the traditional idea of each piece of managed forest, each ‘coupe’ having a forester who is specifically connected to that site, who is the one that cares for and manages that site through all its cycles. Who’s job, life and livelihood is intrinsically linked, long term, to that one site. Basically, a forester would be a farmer, a forest farmer. We need to move away from thinking about the harvesting of forests the way we think about harvesting minerals from the earth and start thinking like caretakers and farmers of a renewable resource. 7. Encourage and develop a culture of purmaculture gardeners so that less land is needed for cropping and herds of animals and more of the farm land can be made into managed timber forests. 8. Promote the idea of self-sufficiency at all levels, as a country and as a state, as well as at a local level. Self-sufficiency is an idea that has got wrapped up with the idea ‘hippies’, so that most of the population just don’t think it is cool at all. But self-sufficiency at a state level means that we won’t NEED to import anything to be comfortable and happy and fed and sheltered. It means being in a state that does not NEED to import goods just to survive. 9. Determine right now what our ideal MAXIMUM population is, that is sustainable for our state, given how much of it is locked up in National parks. 10. get rid of the idea that growth in population and growth in consumerism being good. Because it does equal good. Population growth indefinitely is bad bad bad, as is consumerism. 13. Create Urban ‘plantations’ of exotic trees along the stress – managed by the community and the local councils. 14. Try to change the cultural ideal that tidy, empty space with only grass, straight lines of plants, gravel or chips instead of leaf litter, lots of concrete, etc is beautiful!! None of that is biologically diverse so how is that beautiful? All of these ideas will cost more in time and labor and will mean changing our cultural attitude again… but wouldn’t it be worth it? to live in a greener world with more trees and forests. Wouldn’t it be great to be able to advertise our forest products to the world as the most Eco-friendly and biodiversity friendly in the world? I am sure there is more that I have not considered yet. But this is a start. I look forward to reading yours and others thoughts on all this. I wish victory for your endeavor!!! And really appreciate your energy….keep it up lady, a true environmentalist…great job!!! Hi Miranda, a story concerning you has been published in the German graswurzelrevolution No.377,3/2013, and I remember Julia Butterfly Hill’s action 1997-1999 in California/USA. Thank you very much for your diligence and commitment. I am s student at the University of New Mexico. I am doing a documentary on Political Activist and the use of Digital Media. Would you be available for an Interview for our documentary, via Skype or other? Is there another email to contact you directly? We are scheduling the interviews for the later part of March thru the 1st week of April.
. Thank you for your time. I look forward to hearing from you soon. Hey there Miranda keep strong mon ami..the stand you have taken is wonderful and inspiring. I support you in all your efforts to support this priceless ecosystem. And others endangered at this time.. Saw you on Tv. That’s amazing what you’re doing! Best wishes from Europe, Germany! NOW i see you in German TV! just at the moment I see a documentary on German television about you.